Dr. Vernon Finley’s, Ph.D., interview, recorded symbolically at the Council Grove State Park near Missoula, Montana, helps us improve our understanding of the 1855 Hellgate Treaty and the federal policies that followed from the late nineteenth century to the contemporary era. 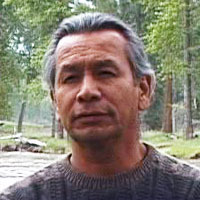 Aqsmaknik Worldview & Land Ownership - Vernon Finley. 1855 Hellgate Treaty and the Kootenai - Vernon Finley. Assimilation and the Dawes Act - Vernon Finley. 1934 Indian Reorganization Act and its effect on Leadership - Vernon Finley. Termination: The Selling of Identity - Vernon Finley. Homesteading on the Flathead Reservation - Vernon Finley.